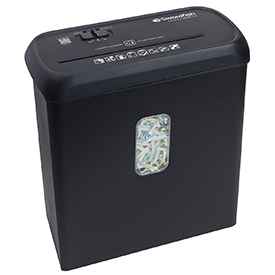 The Swordfish 600XC-P4 is a very fast light-duty shredder with a cutting speed of 2 metres a minute and a 6 sheet capacity to deal with all of your home paper shredding. The 600XC-P4 shreds paper to 4x28mm cross cut pieces, giving this shredder a DIN Security Level of P-4. The viewing window means you can easily see when the 11 litre bin needs emptying. To empty the bin simply use the built-in handle and lift off. The Swordfish 600XC-P4 features auto/start stop and reverse functions, shreds credit cards and staples and can shred a single piece of A4 paper into 555 tiny cross-cut pieces, and can shred approximately 160 sheets per hour.